Continental Games are held in five continents in the Olympic traditions as multi-sport events. After the Asian Games, African Games, Pan American Games and Pacific Games, European Games commenced in 2015. The European Olympic Committees (EOC) announced the launch of European Games at the 41st General Assembly in Rome, on 08 December 2012. The First European Games were awarded to Baku, Azerbaijan. The Games were to be held every four years. Baku 2015 - The First European Games were held in Baku, Azerbaijan from 12 to 18 June 2015. Around 6,000 athletes from 50 countries participated in 20 sports and 253 events. The 20 sports included 16 Olympic sports, two Olympic sports contested in non-Olympic formats (Basketball & Football) and two non-Olympic sports (Karate & Sambo). Twelve of the sports offered qualification opportunities (quotas) for the 2016 Rio Olympic Games. The Opening Ceremony was held at the Baku Olympic Stadium and Closing Ceremony was held in the National Stadium. The athletes' village was located in Nizami raion of Baku. Russia topped the Medals Tally with 79 Gold medals, 40 Silver medals and 45 Bronze medals for an overall tally of 164 medals. Azerbaijan won 21 Gold medals, 15 Silver medals and 20 Bronze medals for an overall tally of 56 medals. Azerbaijan issued a set of two miniature sheets, each containing three stamps on stadiums which were to host various events. These stamps were issued on 19 Nov 2014. 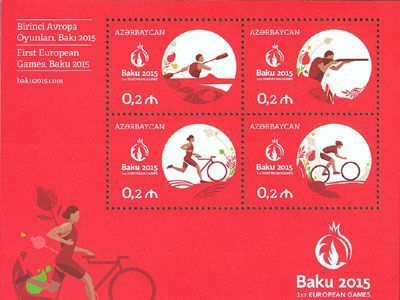 Azerbaijan issued another set of stamps on 23 April 2015 featuring various sports events held in Baku. 2nd European Games Minsk 2019 - The Second European Games were awarded to The Netherlands but it withdrew due to lack of funds. It was then awarded to Russia but due to WADA investigations against Russia, the IOC refused to support the Games. Finally, Minsk in Belarus was declared the host city. Minsk 2019 -2nd European Games are now scheduled to be held in Minsk from 21 to 30 June 2019. Around 4,000 athletes from 50 European Countries are expected to participate. The games will feature 199 events in 15 Sports. Eight of the sports will offer qualification opportunities for the 2020 Tokyo Olympic Games. The opening ceremony is scheduled to be held in Dinamo stadium on 21 June 2019. The slogan of the event is "Bright Year, Bright You". A baby fox named 'Lesik' has been chosen as the mascot for the Games. 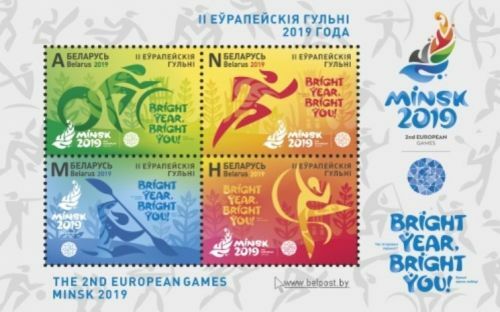 Belarus has issued a miniature sheet with four stamps featuring various sports events (Cycling, Athletics, Rowing & Rhythmic Gymnastics) to be held during Minsk 2019. This miniature sheet has been released on 01 February 2019.